As already mentioned in the Preface to Volume I, and then detailed in its Section 1.5, in Volume II of this monograph constructional aspects of suitable designs are to be discussed, particularly with regard to some statistical concepts essential for planning of experiments. 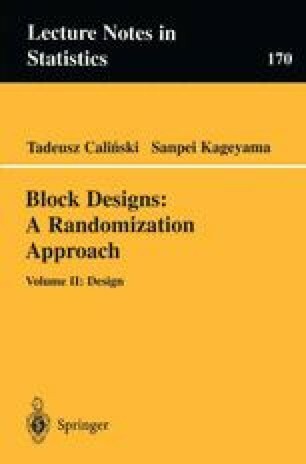 In the present chapter various methods of constructing designs will be described, along with some combinatorial and statistical properties of block designs, mainly those related to the efficiency factors of the design for estimating the corresponding basic contrasts in the intra-block analysis, as defined in Section 3.4. In general, the classification of block designs adopted here is based on the new terminology proposed in Section 4.4 (see, in particular, Definition 4.4.2). It may be helpful to recall it shortly.